Exercises for Back Pain and Sciatica – Why They Mightn’t be Working. The customary approach taken when trying to address and fix chronic back pain or sciatica is to prescribe a series of stretching and exercises. However, pain sufferers find themselves become increasingly frustrated when these exercises and stretches don’t work to provide any lasting result. Over the years many exercise and stretching programs have been put together to fix chronic back pain and sciatica, but the sufferers who have tried them will undoubtedly agree that they don’t work, – at least not to the point where they can stop doing the exercises and enjoy a pain free life. So then the question to ask is why don’t exercises fix these problems ? The answer to why the exercise is not the best way to fix pain is actually quite simple and logical as I’ve found, are most things to do with the body. For a muscle to benefit from exercise it needs to be in a healthy and functional condition. It needs to be able to contract and release and play its part in the orchestrated movement of all the muscles throughout a persons activities. The reality is a body that has pain with a back problem will have a number of muscles that are not working in the body the way they should. They are not healthy and not functional and therefore they do not respond to exercise well. What ends up happening when you try to strengthen them is other muscles need to compensate for them and become overworked. This is what causes muscle imbalances and the structure to twist or tilt to one side. A body with a back problem is already like this so it ends up exasperating the existing problem and the pain gets worse. The opposite affect to what you are trying to achieve. You might get some pain relief from the initial strength exercise provides. However, when you stop exercising, the strength you have built up in the muscle slowly drains away quickly and the pain re-surfaces, especially when its origins are located in the core muscles that you rely on to support your everyday movements. Those that have experienced some success with exercise most likely started exercising when the pain had already settled. The sufferers who struggle constantly with acute pain are often unable to begin an exercise program that doesn’t irritate their pain even more. Even if they do start, the pain it causes is usually enough of a reason for them not to continue. Chronic back pain mostly starts with muscle imbalances in your body. An imbalance is where the muscles on one side of the body are in a different condition to the same muscles on the other side. These imbalances don’t allow the body to more freely and cause pressure to build up and irritate your joints. Exercising when you have muscle imbalances only serves to ensure that these differences and imbalances are maintained! Problem muscles do not respond well to exercise or stretching because they are usually tight and weak. There is a poor blood supply and so they do not function to provide strength and support for the body the way they were meant to do. When the muscles are tight and weak, the nerves are also not firing into the muscle properly. Exercise requires an increase in volume of blood supply but, because in weakened muscles, this blood supply is restricted, the muscles become overloaded causing them to fatigue and shut down. A loss of flexibility is often the end result of this muscle fatigue. Often when you lose flexibility you can also feel a temporary lifting of pain. The reason this happens is because the tightening muscles restrict the movement of the joint where the irritation and pain are being felt. If you do exercise, you will often manage to keep pain somewhat at bay if you work out regularly, but if you stop for a few weeks or longer, the lack of blood flow and tightness causes the problem muscles to deteriorate and weaken very quickly. The best way to deal with any muscles in the body so that they respond to exercise in a positive way, and actually rehabilitate during the process, is to get the circulation working through the muscle again and restore function to the muscle before you start putting any real load on them. 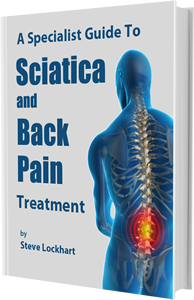 For a little more information on how to treat your own back pain or sciatica and stop the frustration of wasting money on treatments that are not helping you, visit the back pain blog offering advice and information to help you make informed decisions for yourself. Learn more. I have had 2 separate back ops, 1988 l5-s1, spacers with bone grafts, and l4 -l5 spacers in 1993. Suffering worse and worse with grabbing in lower back, pain in left buttock, pins and needles, hot foot, tight calf and painful to the touch all on left side of my back. I feel that i am getting my sciatic nerve pinched or squashed somewhere. I am on disability support and can’t work. Do you think your methods will help seeing as i have been fused together. As you can understand I don’t want to part with any more money as i have had physio, acupuncture, chiro and water treatments that haven’t helped. Is there any chance of a trial period or something. If you have watched my video at http://www.backpain.com.au/getrehab you will see why what you have tried hasn’t worked. Unfortunately if you are not willing to spend any more money on treatments you will have to live with things as they are. I and I am sure most other therapists can’t live without their income and we are not responsible for the money you have spent on useless treatments so far. Perhaps it would be fairer to be asking the therapists you have paid for nothing for a refund instead of asking people you haven’t seen to work for free. I see so now i’m following you. I really like it when people get together annd share views.